Bihu is the most important festival of the Assamese people that is observed by all, irrespective of class and caste. With the passage of time, this festival has been adjusting itself at different ages, taking into consideration the changed situation of a particular age. Bihu is mainly a culture of the masses, secular in concept and it is intimately connected with agriculture. 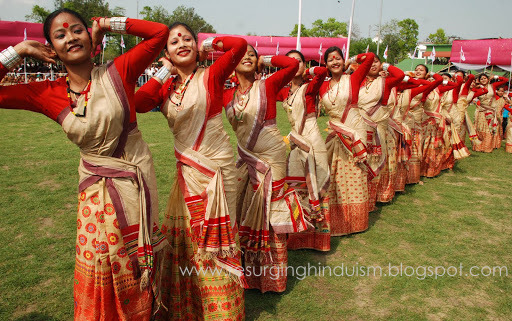 The most popular one is the the Bohag Bihu or Rongali Bihu, which refers to the onset of the Assamese New Year, ie, April 15 of every year and the coming of Spring. Its a time of merriment and feasting and continues for several days. The farmers prepare the fields for cultivation of paddy and there is a feeling of joy around. The ladies make pithas and larus, the traditional food made of rice and coconut which gives the real essence of the season. The first day of the Bihu is called Garu Bihu or Cow Bihu, where the cows are washed and worshipped. This is followed by Manuh (human) Bihu. The folk songs associated with the Bahaag Bihu are called Bihugeets or Bihu songs. During this time the young people in the village move around in groups along with pretty girls dressed in the beautiful traditional Assamese attire and singing bihu songs of love and romance. Magh Bihu or Bhogali Bihu, celebrated around mid-January, marks the end of harvesting season and there is a lot of feasting and eating during this period. The granaries are full and thus the people come together and make a small hut type structures called Mejis with the hay of the harvest fields and during the night, prepare food and there is community feasting everywhere. The meji is a structure built of logs of wood placed in pairs, tier above tier till they rise to considerable heights and present the appearance of a lofty temple. The entire night is spend around a bonfire with people singing bihu songs, beating drums or playing games. The next morning, people gather around the mejis and throw pithas (rice cakes) and betal nuts to it while burning it at the same time. They offer their prayers to the Fire God and mark the end of the harvesting year. Kaati Bihu or Kongaali Bihu, celebrated in mid-October, has a different flavour as there is less merriment and the atmosphere has a sense of constrain and solemnity. Held on the last day of Aswin, this festival coincide with the autumnal equinox .It is called Kangali (poor) because there is not much to eat at this time of the year. The main function associated with this bihu is the worship of the sacred tulasi (basil) plant at the root of which earthen oil lamps are placed.